Florida Gators basketball (3-4) is below .500 through seven games for the first time since 1998 and hopes to avoid hitting the even mark at home when it hosts the Yale Bulldogs (8-2) on Monday at the Stephen C. O’Connell Center in Gainesville, Florida. 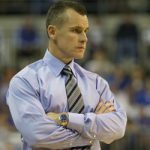 Head coach Billy Donovan met with the media on Sunday to discuss his remaining concerns about the Florida basketball team and update the Gators’ injuries. When the moment gets too big, when the game gets too close, Florida has – for the most part – crumbled during the early portion of this season. That’s the only way to describe the Gators giving up an 18-point, second-half lead on the road against the Jayhawks with Kansas using an incredible 23-3 run to retake the lead at home and hold on for the victory. Donovan believes Florida’s biggest issue remains the players’ inexperience. Yes, the Gators have some veterans on the roster in redshirt senior center Jon Horford, redshirt junior forward Dorian Finney-Smith and junior guard Michael Frazier II (plus redshirt junior G Eli Carter, who remains out with a foot injury), but none of those players has ever been counted on to play starters’ minutes on a consistent basis with all the pressure squarely on their shoulders. “The heavy lifting is a lot different than it was last year. There’s a lot of different heavy lifting going on right now that those guys didn’t even think about factoring into. Right now, they’re starting to realize that with his heavy lifting, this is really hard. What they’re doing right now is not easy. A lot of different players go through this,” explained Donovan. For Frazier specifically, who is shooting nearly 10 percent worse from beyond the arc this season despite averaging a career-high 14.4 points per game, Donovan believes he still has a long way to go to become a consistent and responsible player for the Gators. “[When] you get into a situation where you’re ready for another year and you start thinking about expectations you have on yourself and what you want to do, and you’re working hard and you’re getting ready, most players never factor in adversity. He’s factored in zero adversity – zero,” Donovan said. One of Florida’s biggest problems early this season has been the Gators getting close to nothing from a couple of its younger players, namely sophomore C Chris Walker and freshman F Devin Robinson. In Donovan’s mind, neither Walker nor Robinson has earned additional playing time despite each having his best game of the season last week at Kansas. Donovan needs both to prove they can be consistent on a game-to-game basis in order to see more action overall. “I thought he did some really, really good things. He only was able to play 15 minutes in the game. I would have liked to have played him more,” said Donovan of Walker’s effort on Friday. “I think the biggest thing he’s learning is how hard he has to play, and he’s not really able to sustain high levels of intensity for long periods of time, but he has given us 2-3 minute stretches where he has utilized his athleticism. He’s doing some things where he’s growing in a positive direction and gave us a positive lift in the game. “He just needs to keep on that attitude, and I’m not so sure his attitude’s always been like that. When you’re highly-decorated or everybody tells you that you’re really good, and you’ve never been exposed in this situation, it’s hard to learn. It’s really hard to learn. But when you get thrown into a situation where you’re playing against high level competition, sometimes you actually get a better opportunity to learn through those experiences than you do just everybody telling you how great you are. Donovan believes Robinson has “made some strides,” certainly with his shot and overall discipline in the game. He was pleased with Robinson’s ability to keep his legs under him and stay a bit more aggressive on defense, but there was one thing in particular that stuck out to him. “The biggest difference I thought was him playing with a high level of intensity. That’s what he needs to keep doing,” he said. Carter remains out of action as he continues to rehabilitate from what was first a termed a mid-foot sprain and was recently described by Donovan as an “ankle sprain.” Whatever the ailment, Carter has been cleared to play by doctors and trainers but has not done anything for the Gators since returning from the Bahamas. Though understanding of his injury, Donovan is ready and waiting to get Carter back on the court as soon as the player is ready to go. “Out. Yep. Not playing. He’s cleared to play. He’s cleared to play. He’s just still having pain. The trainers are still trying to work with him. The doctors are still trying to work with him and try to figure it out. … There’s nothing broken. He did have an ankle sprain, but I don’t know how much more we can actually do for him. I know he’s having some discomfort and he doesn’t feel comfortable moving laterally,” he began. Horford has also been dealing with a swollen bursa sack in his knee, which had him in and out of the Kansas game. Donovan said he has practiced all week, as has Finney-Smith, though he’s sat out portions of practice in order to help heal the two fractured bones in his hand. 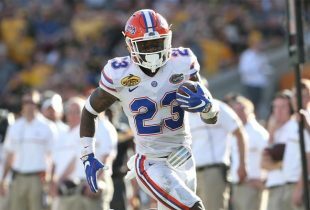 Unless Walker gets significantly better as the season progresses, and Eli Carter remains healthy after this recent stint, then Florida is in big trouble.